Sometimes, it’s more about what you don’t do than what you do. With that in mind, traveling with children is akin to life with children in general. You need to think in smaller slices, more in line with their minute capabilities than your own older, greyer ones. That’s how I approached Tuscany. Although it wasn’t entirely my own ingenious thinking that arrived at this scaled back solution, but rather a medley of influences, some subtle and some not so, that sealed the deal. For starters, the heat made my limbs feel more like noodles than accomplices, making it easy to pass up a trip to another medieval town in lieu of the shade by the pool. There is a reason I don’t live in central Canada, stifling hot summers chief among them. The other significant influence came in the form of the two other families staying at our accommodation. One family who left early and returned exhausted each night, the other who barely left and seemed to gain rejuvenation as the week went on. It was an education in itself. But perhaps the biggest of the sedentary influences was the drastic change in my diet, whereupon I substituted gelato for greens, white carbs in the form of several pastas for whole grains, and of course chianti for water. Such changes don’t lend themselves to the get-up-and-go mentality. Arguing (to know one in particular) that this was a big part of life in Italy, we slowed down our pace, like the Italians do everyday from noon to three, in favour of the finer pursuits in life. That is to say, the art of doing nothing. Yet we did manage to struggle to our feet and make the journey to a few local hot spots. 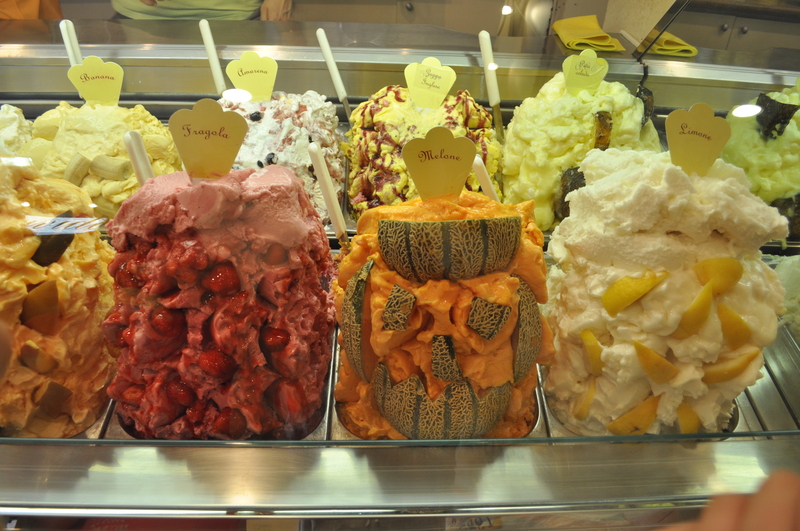 We conquered local villages dangling the promise of gelato in front of our children’s noses. The caveat was they had to order for themselves in Italian. As a result, they can sing gelato flavors in Italian like nobody’s business. 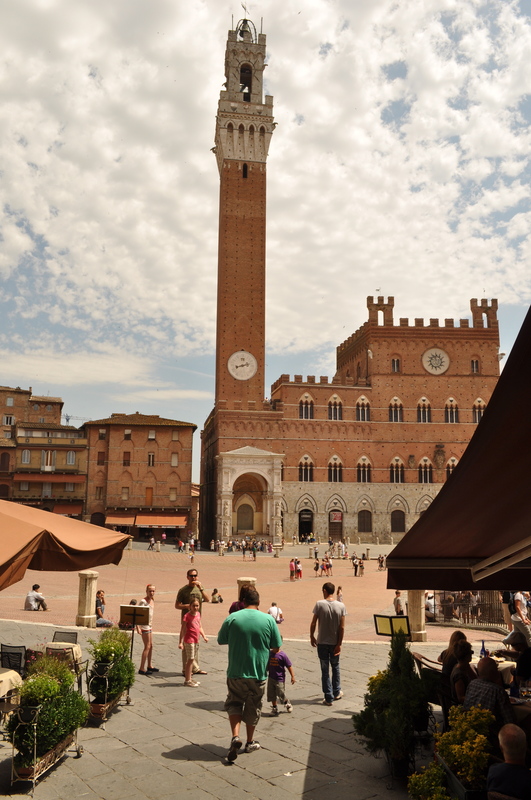 We did a day trip to Siena, highly successful despite the sauna-esque temperatures, because of the challenge of counting the stairs while climbing the Torre del Mangia. They were as thrilled by the narrow, twisty staircase and uneven marble steps as they were by the sweeping views from the top. And then gelato to celebrate. San Gimignano, on the other hand, was not so successful. The hour and a half car ride felt like an eternity since world war three waged in our backseat, our children not so happy to be in such close proximity to each other for the trip. The town itself was beautiful, but it was hard to see its famous towers for all of the tour buses. We decided to put off Florence for a few days. And then looking at the weather forecast, the sun mercilessly beaming back at us everyday for the foreseeable future, we delayed it a few more. Finally, our last day in Tuscany loomed. Florence had charmed me as a backpacker and then again in my twenties, so I couldn’t justify denying it to my children. Crowds and heat be damned, we were going. The promise of gelato was augmented with the prospect of buying something for each child in the San Lorenzo market, and we were off. We have an uncanny knack for picking busy days, and this was no different. As we gawked at a snaking, unmoving line for the Duomo, we learned it was in fact an Italian holiday. Every Luigi and his mother had apparently decided to spend it in Florence, rendering the lineups for the Uffizi and Accademia Galleries, normally long to begin with, virtually impregnable. Nevertheless, my children were suitably awed by the market and diligently searched for a treasure of the leather variety that Florence is so famous for. They were charmed by the Ponte Vecchio and fascinated by all the locks with lovers initials chained nearby. They devoured their pizzas and lingered over their gelato, and we called it a day. The list of things we didn’t do in Florence is far longer than the few things we did, but I soothe myself with the old words of wisdom that sometimes less is more. We went, we saw (some), we conquered. We left Florence hot, tired, but happy, a mission accomplished. Just a less ambitious mission. sounds wonderful Dee! and very pragmatic thinking. enjoy! Smart girl. You could have packed your trip full of things that would have been a stress to get through! Less is more! I agree with Tori. Less is indeed more! We don’t travel with kids, but bringing dogs along has similarly slowed the pace for us! Glad to hear you’re enjoying yourselves, despite the heat!